It appears that the work of a learning professional is never done. 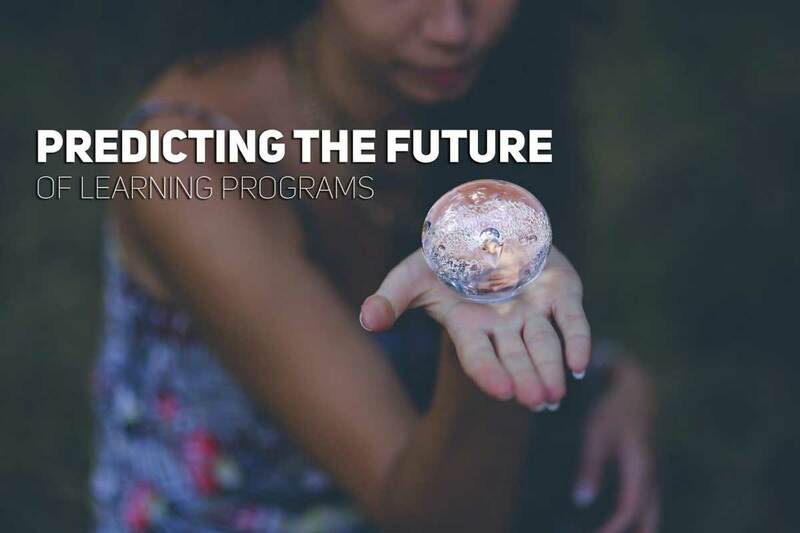 In order to establish an effective learning program, there must be a great consideration for the future needs of the day to day business, and the workforce themselves. One cannot simply establish a program and walk away stating that it is as perfect as it will always be and there is nothing more we can do as an organization. Learning is a fairly nebulous industry. The opportunities to improve upon our past successes are abundant in every turn. Whether it be addressing the blended learning mix we provide, the content we promote directly, or the style in which our learners process information; there are countless decisions that we can make, and the answer that we provide today, may not be what is most effective weeks from now. First things first, establish a platform that you are confident will grow along with your organization. Learning Management Systems (LMSs) are the foundation of the learning process. Picking the one that not only suits the need of your organization today but has a clear roadmap for innovation and product enhancements along your entire user experience, can go a long way in maximizing the return on your immense learning program formation efforts. When exploring a potential LMS, be sure to take into consideration features that are soon to be available, as they may give a precise picture of learning initiatives that can be included to propagate the reach of the organizational learning. The 70:20:10 rule, suggests that learning should be delivered in a manner that is 70% knowledge acquired from job-related experiences, 20% from social interactions, and 10% from formal educational objects. This mix is widely accepted as an industry standard and practiced across a huge assortment of learning segments. That being said, part of ensuring the longevity and reach of a learning program is performing the due diligence on where the field is going. Meaning, keep your ear to the ground and look out for any outlying theories that may contradict this ideal mix, and be aware that with all the new forms of learning that are quickly enhancing the marketplace, there is a very real chance that this model may need to be tweaked, to also represent unaccounted for learning objects. The Greek Philosopher, Heraclitus, was recorded multiple times for saying “Change is the only constant in life.” In the learning world, perhaps more now than ever, this position has never ringed truer. Measuring the effectiveness of current offerings is vital in any learning environment. The content you are providing right now could be incredible, and your staff could be entirely enamored with the wide range of capabilities your learning and development department has focused. Or, possibly and most likely, the employees within your organization could potentially be providing hints and messages on the need for new courses, all of which may not be falling onto the appropriate and capable ears of the capable system administrator. Instead, the learning department, in general, could possibly be struggling with a lack of knowledge growth. Organizations are most effective when they grow organically, with this growth, comes a new wealth of knowledge, which can make for a timely addition to the learning mix. The learning world is changing. It used to be that in order to obtain compliance training, employees would have to undergo grueling round table instructor-led training (ILT). However, today that is no longer the case. Outside of E-Learnings as a newer platform to maximize user buy-in, a variety of efforts are starting to be included into a well-blended mix, such as Social Learning, Gamification, and Micro Learning exercise. The collaborative appeal of social learning offers a new way to improve user intrigue by allowing for the convention of an additional system user, providing both expertise and a unique perspective towards a variety of experiences a user can encounter within a learning program. For gamification, the users which you have been addressing with traditional learning exercises can now be provided a new outlet, which may serve to reinvigorate users, as well create the value proposition of self-motivated individuals to perform within the program itself. Thirdly, microlearning can be utilized to extend the reach of the previously established learnings. Instead of getting stuck on a certain aspect of a course. You can now provide an overview of specific hard to understand content, in order to ensure the awareness of all aspects of a process, across the scope of the organization. The future may seem entirely uncertain, but one thing is definite; preparing your learning department for industry advancements while keeping your eyes open for future state innovations can be the difference between a fledgling program and one that turns a business into a finely tuned and oiled machine. In order to properly prepare system administrators we recommend the following: establish an environment that will not only grow with you but also offers all the functionality your organization currently needs to produce the best possible learning for its staff. Then, lend specific focus towards the delivery method employed (how formal is the learning mix? What portion of it feels as if it is being directly pulled from the staff members themselves?) Rely on reporting and measurement to continuously evaluate the content that is being delivered. Pay close attention to content that is being perceived as less and less effective, as these often indicate areas with the largest potential for growth. Finally, do not be afraid of employing the utilization of new elements within your learning environment. Though it may seem that a lot can be achieved just through a classroom session and/or an E-Learning, there is still the possibility of expanding the reach of the provided learning. As always, thank you for joining us here at the Gyrus Blog, be sure to subscribe at the top right-hand corner of this page (Bottom if you are viewing this via a mobile platform), in order to get this fresh content distributed directly to your email inbox as it is posted. As well as follow us on social media for new content, product news, and interaction directly from Gyrus.